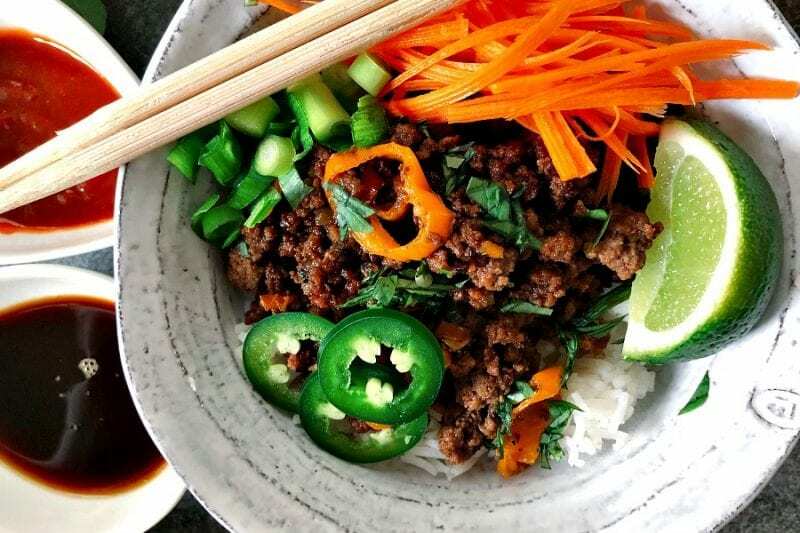 This bowl of Paleo Thai Basil Beef Stir Fry is going to become a weeknight staple in our home. I hope it becomes a staple for you too! If you read my book Come & Eat then you know I am so passionate about brining people together over a meal. I want to keep serving you by giving you even more recipes! So, thank you to everyone who voted! I’ll be posting a new recipe every Thursday! And be sure you’re following me on Instagram as I always share more about my life and meals in that space. I have tested this recipe quite a few times, in fact I took a few months off from testing it because I was getting frustrated. Recreating the bold and umami flavors of soy sauce and dark brown sugar was a little more to reckon with than I thought. But a few weeks ago I stepped up to the stove again and nearly burst into tears of joy when the finished product came out. And then Jeremy and I ate two full bowls for dinner. So, there’s that. Coconut Aminos instead of soy sauce. Coconut aminos is a sauce made from coconut sap. People who are paleo or gluten free often use this in place of soy sauce because it has a rich, salty and sweet flavor (like Soy Sauce). Coconut sugar instead of white or brown sugar. I am not going to lie – I was skeptical. This was my first time using coconut sugar because I generally use honey as a sweetener. But it did not disappoint! The sauce is made with the coconut aminos, the coconut sugar and fish sauce (I use Red Boat!). I also made Nom Nom Paleo’s paleo sriracha and it is AMAZING! This stir fry comes together so fast and it is so versatile. You can use whatever veggies you have on hand. I used what was in my refrigerator! 1. Heat oil in a skillet over medium high heat. 2. Add bell pepper and red onion, sauté for 3 minutes. 3. Add garlic, basil and ginger stirring until fragrant, about 2 minutes. 4. Add ground beef, crumbling with a wooden spoon. Let brown until cooked about 6-8 minutes. 5. In a separate bowl mix the coconut aminos, coconut sugar and fish sauce until combined. 6. Add sauce into the skillet and sprinkle salt over beef mixture. 7. Cook for an additional 2-3 minutes to allow the sauce to caramelize the beef. 8. Turn off heat. Squeeze the juice of 1/2 a lime over the stir fry (you can skip this step and serve everyone lime wedges if some people in your family do not like lime juice). Mix to incorporate the lime juice. 8. Serve over basmati rice or fresh greens. 9. Optional: Top with shredded carrots, scallions, fresh basil, sliced fresh jalapéno, and a lime wedge. Note: This recipe serves 4 adults. For more servings just double or triple the recipe!